Heavy duty tubular steel welded trucks with quality beech effect timber platform. Metalwork powder coated blue, RAL5007. Mesh grid size - 50 x 50 x 4mm. Internal height of removable sides - 500mm. On two fixed and two swivel 200mm dia. rubber tyred castors - swivel castors fitted with brakes. If you have to constantly move heavy goods around your warehouse, invest in one of our premier platform trucks to make the task easier. Made from heavy duty tubular steel, these trucks come with two mesh ends and two sides for sturdy movement. 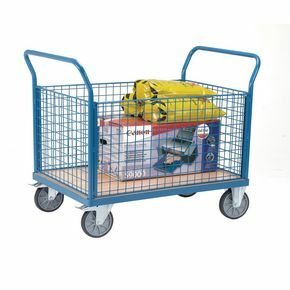 On two fixed and two swivel 200mm diameter rubber tyred castors, our platform trucks can easily be manoeuvred around corners and also have brakes, ideal for keeping the truck firmly in place while loading and unloading. This truck can withstand weights of up to 500kg û ideal for heavy duty goods transportation.